This Saturday, Rick and I set out to the picturesque town of Ashburton. Our mission was to explore the first of 19 churches on Simon Olding’s list of buildings Hems worked on – St. Andrew’s – and take some photos to use in the church detectives game. Before going inside, we had a thorough look round outside, and took some exterior shots which we will be able to use on the Moor Stories website. This way, potential church detectives will be able to check they are investigating the right place! Once inside, we took some shots of the whole of the church. These will be used for the practice round of the church detectives game, which will help people ‘read’ the interior of a church and identify the features they will be looking for. After this, it was time to play church detectives! 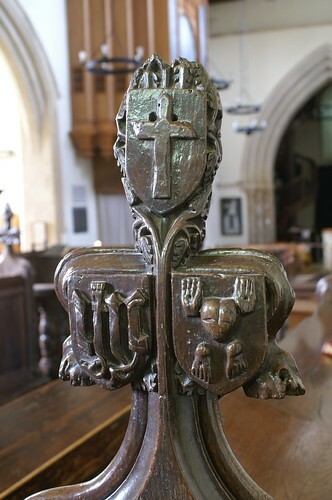 We hunted all around the church to seek out the best examples of wood carvings, and discovered some great roof bosses and bench ends. Most excitingly, we spotted a bench end with some similarites to one mentioned in this post by Gabriella. It was a great feeling to start making the connections between objects which we hope will form the heart of the church detectives game. After all that hard work, we just about had time for some tea and cake before heading back to Exeter. Now we have to try and whittle down all the photos to some key images, before tackling the rest of the churches on the Hems list!